Hundreds of thousands of people, mostly Kurds, have been displaced by eight months of fighting between the Turkish military and Kurdistan Workers’ Party (PKK) militants in the country’s southeast. As the situation continues to deteriorate, some observers have begun comparing the situation to the brutal war that engulfed Syria five years earlier. 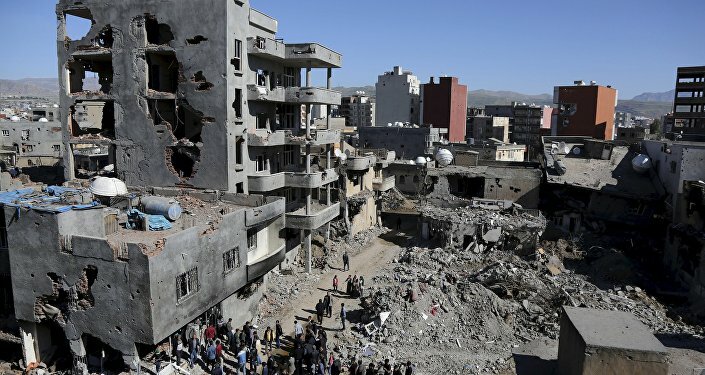 Turkey’s Kurdish-populated southeast has been devastated by the ongoing Turkish military operation against the PKK, with restive areas subject to months-long curfews and the razing of entire city blocks. The historic center of Diyarbakir, one of southeastern Turkey’s largest cities and the ‘de facto capital’ for Turkey’s Kurds, “has been under military lockdown for four months,” and is looking more and more “like Syria,” Senay, a local resident forced to flee the area, told the European edition of Politico. The ongoing conflict, Politico suggested, “is turning corners of [Turkey] into versions of Syria,” with a campaign of brutal street warfare forcing nearly 400,000 people to leave their homes since August 2015, becoming internally displaced persons. Unfortunately, the magazine added, “the surging violence has received little attention in Europe, which is preoccupied with stemming the flow of refugees from conflicts next door to Turkey in Syria and Iraq.”Tensions between Ankara and the Kurds escalated last summer after Turkey launched a military campaign against the PKK in northern Iraq and southern Turkey, after the group claimed responsibility for the killing of two Turkish police officers, and accused Ankara of supporting Daesh. Predictably, Politico noted, “local residents have borne the brunt of the fighting,” with “at least 250 civilians…killed across southeastern Turkey since August, according to a recent report by the International Crisis Group.” For his part, visiting the heavily damaged town of Cizre, near the border with Syria, RT correspondent William Whiteman cited local estimates which suggested that between 500-600 civilians had been killed in Cizre alone, with Turkish forces attempting to hide civilian deaths. “Half of Cizre is not fit for living anymore, and the other half is damaged, too,” Raci Bilici, the head of the Diyarbakir branch of Turkey’s Human Rights Association, told Politico. Following a recent visit to the town, Bilici compared what he had seen to Kobani, the Syrian Kurdish city captured and destroyed by Daesh terrorists in the summer of 2014.”Europe, of course, is silent because of the refugee issue,” the rights activist complained, noting that when he visited Berlin to try to raise the issue with German lawmakers, the latter showed much more concern about the issue of Syrian refugees. In their search for a deal on Syrian refugees, Politico notes, “EU officials have refrained from criticizing Ankara’s military campaign against the PKK,” despite the fact that “many of Turkey’s allies –including several EU countries and the US –support the PKK’s Syrian affiliate, the YPG, who have been at the forefront of the fight against the Islamic State [Daesh],” across the border. “People lost their homes, people are being killed. All European countries know this is happening but because Turkey plays the refugee card, they don’t say anything,” Sibel Yigitalp, pro-Kurdish People’s Democratic Party (HDP) lawmaker from Diyarbakir, told the magazine. Despite Europe’s decision to look the other way, and Ankara’s pledge to assist the hundreds of thousands of internally displaced persons its crackdown has created, Yigitalp warned that Turkey, and Europe, won’t be able to escape the consequences of their actions (or inaction). “What help can a state give to refugees if it is killing its own people, if it is creating refugees in its own country? If the Kurdish conflict becomes a war, don’t they think that Turks and Kurds may eventually flee to Europe too?”, the politician asked. “Some have already tried,” Politico notes. “Last month, the Turkish Coastguard discovered 12 Turkish Kurds among a group of Syrians and Afghans who had attempted to sail to Greece.” As the fighting in southeast Turkey continues, and the number of Turkish-Kurdish internally displaced persons grows, so too will the number of Kurds seeking refuge outside Turkey.